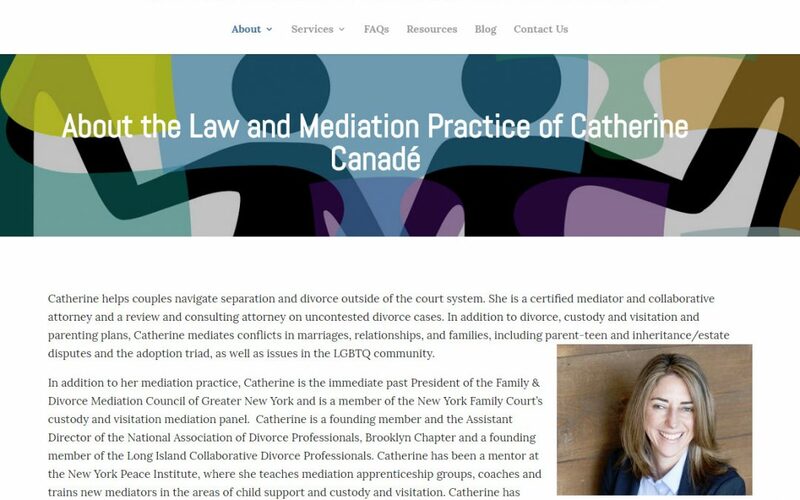 Attorney and Mediator Catherine Canadé needed a website update. Her WordPress site had been using a somewhat creaky theme that was not so mobile friendly and had some security issues. Websites in 2018 have to look good on small devices. Over half of all Internet traffic originates on mobile. (Source: Statista) It should go without saying that website software, to avoid security problems, must stay current. We refreshed the site using the Divi theme by Elegant Themes. We were able to capture much of the look and feel of the former site, while updating the underlying software to provide for a smoother, faster, more pleasing browsing experience, especially for mobile. We identified the fonts, colors and even some of the images Catherine had previously been using and incorporated them in the new design. Catherine opted to host with GoatCloud so we were able to provide her not only with fast, reliable hosting, but also an SSL certificate at no extra cost so her visitors can browse a secure HTTPS website. You can visit Catherine’s refreshed website at canadelaw.com.